Ever have one of those awesome dreams where you're totally surrounded by all your favorite foods? And you dig in gleefully, not worrying about calories... but then you wake up and feel a little cheated? Well, maybe that's just us. Nonetheless, chefs from top D.C. restaurants -- such as Citronelle, Brasserie Back and Volt -- will be dishing up apps, entrees, and obviously, cupcakes and other desserts galore. Yes, our depraved food dream will soon be a reality at the LivingSocial Best of Washington Party on July 13. 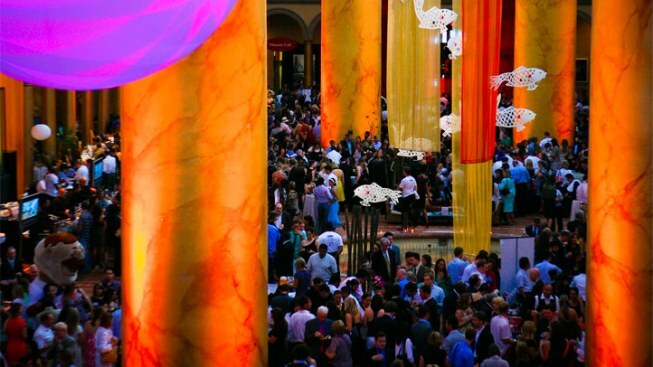 Every year, the readers of Washingtonian vote for their favorite restaurants and bars in the D.C. area, and every year, the big winning restaurants gather at the National Building Museum (440 G St. N.W.) to serve their delicious delights. More than 60 of the Washingtonian's 100 Very Best Restaurants will be in attendance. Some notable chefs will also be there, including Michel Richard (Citronelle, Cental), Tony Conte of the Oval Room and Bryan Voltaggio (of Volt and "Top Chef" fame). You can order tickets here for $95-$125.